When a company re-brands, it typically means a new coat of paint over the old, and maybe an ad campaign to tell consumers that their logo has changed. For American Airlines, however, the re-branding is going deep, deep into the roots of the company, from top to bottom. More than just a fresh coat of paint (well, a lot of paint on a lot of aircraft), the re-branding at American Airlines is a total overhaul of the entire customer experience. 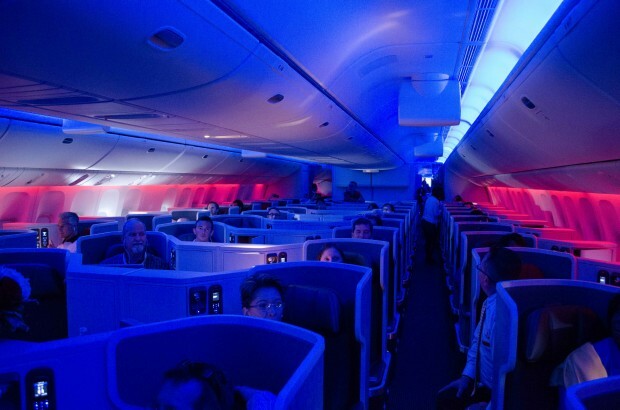 Everything from the logo, to the cabins, to the aircraft type is experiencing a major change. Ordered about two years ago, American Airlines has started taking delivery of the Boeing 777-300ER (773) this year, the first airline in the United States to do so. 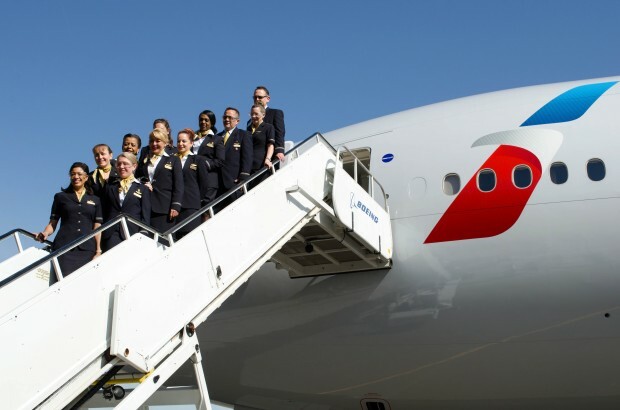 Although the 773 entered service earlier in the year, the airline never took the time to fully celebrate the introduction of the new aircraft type into their fleet, and that is exactly what they did last week with the delivery of their sixth 773. 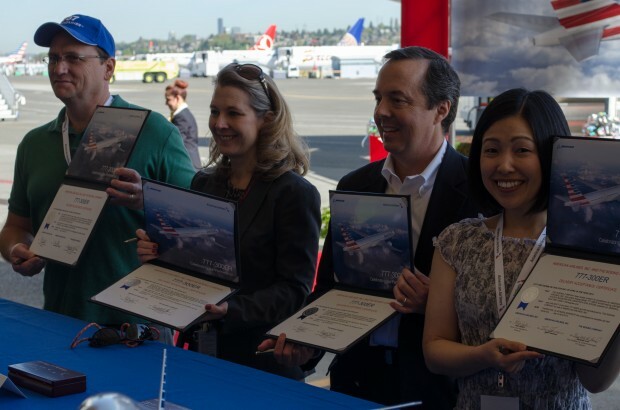 As a part of the celebration, we were invited for an exclusive tour of Boeing’s factories in Renton and Everett, as well as a celebratory dinner and finally the delivery flight itself. The tour of the factories was limited to select media, which we were thrilled to be a part of. The first stop on the tour was the 737 factory in Renton, Washington. With full privileges to take photos, we shot everything in sight. 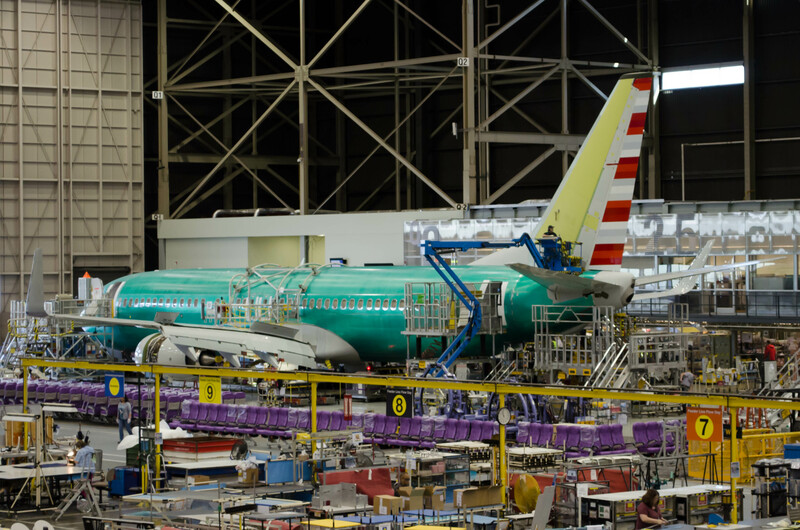 From the delivery of the green fuselage, to the joining of the wings, to the installation of seats, this factory now cranks out 38 737s a month. One of these aircraft on the line just so happened to be a brand new American Airlines 737. 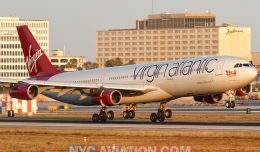 For most of the aircraft on the line, it is very difficult to tell exactly which airline the new plane belongs to. On the factory floor, only the tail rudder and winglets are painted, so identification is difficult. However, American’s tail is so unique that we were easily able to point it out from quite a distance. Over at Everett, we had yet another rare opportunity to tour the factory floor, where the 747-8i, 767, 777, and 787 are produced. Inside the factory, the seventh and eighth American Airlines 777-300ER were actually in production, and we had the chance to see what goes into making such a prolific aircraft. The sheer size of the individual parts of a 777 is incredible when seen in their raw form up close. 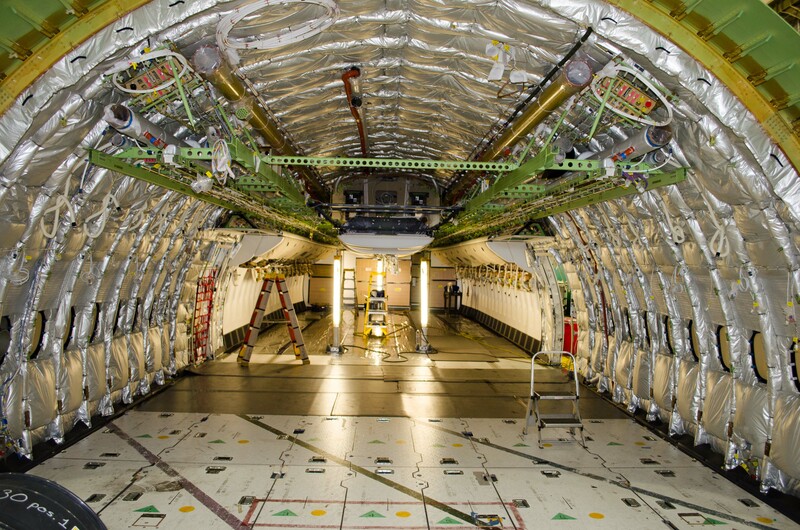 When you see the bare fuselage of the 777, you may not even recognize what you are looking at. Before it is fitted with the floor, overhead bins, sidewalls, and seats, the fuselage is cavernous. Seeing what goes behind the walls, where the oxygen masks are stored, and the placement of the crew rest above is ceiling is a truly unique experience. That afternoon, Paine Field saw the arrival of a special aircraft. An American Airlines 737 with the new livery was chartered up from Dallas with over 100 employees on board, to help start the delivery celebration. The airline employees that were chosen to be a part of the delivery celebration ranged from maintenance workers to senior executives, and everyone was excited to see the new plane. For most, this would be their first time on a 777. At the Museum of Flight that night, a celebratory dinner was held, with the very airplane we would ride home on sitting in the parking lot right outside the windows. Talk about a room with a view! 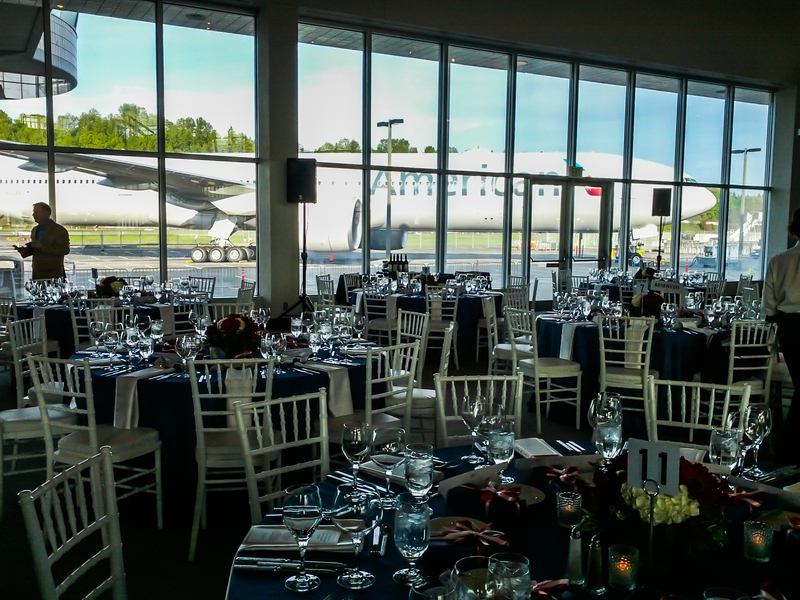 At the dinner, the mood was jovial, and representatives from Boeing, American Airlines, and GE gave speeches about how meaningful this new airplane is to the airline. Boeing presented American with a truly huge 773 model, while GE presented them with an actual fan blade from a mammoth GE90 engine. The next morning, the third beautiful Seattle day in a row, we were bussed down to Boeing Field for the delivery ceremony and flight, but got some news along the way. Somewhere along the way, a “paperwork issue” had come up, and the delivery flight of the new 773 was in jeopardy. In the meantime, N719AN was ferried up from DFW to Boeing Field, which ended up being our ride for the day. 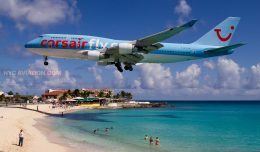 Although not technically a delivery flight, the experience would be identical. At Boeing Field, over 100 American Airlines Employees gathered to watch the signing ceremony. 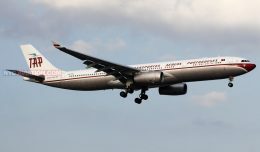 Several documents were signed, officially taking delivery of the airlines sixth 773. Two employees were even chosen at random the night before to sign the documents, a memory which we’re sure will last quite a long time for them. Cross the T’s and dot those I’s! After a few employee poses in front of the plane, we boarded and found a nice row to claim our own. If we were always able to claim an entire row to ourselves, we would never have a problem with economy! After plugging our various devices into the power outlets, those mammoth GE90s growled as they came to life, ready to take us back to Dallas. Our plane taxied by the Museum of Flight and onto the active runway, where we would experience a high performance takeoff. 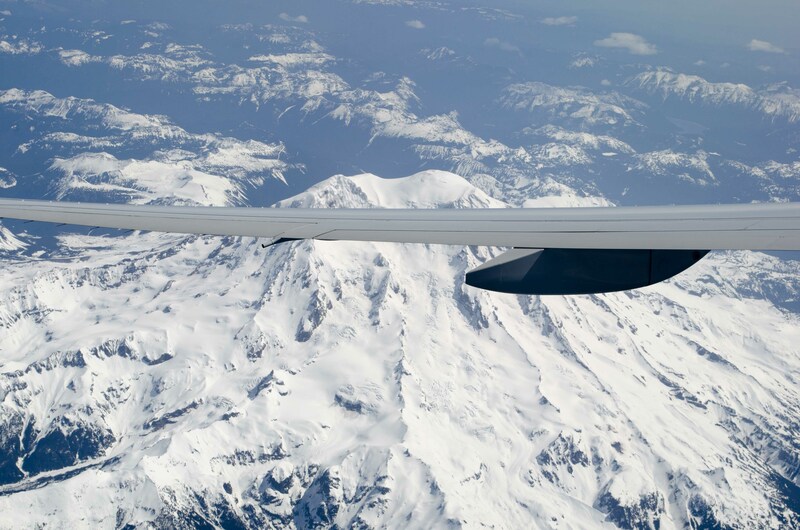 Virtually effortlessly, we were in the air, getting an amazing view of Seattle, Mount Rainier, and the breathtaking Pacific Northwest. Once at altitude, the real party began. Everyone started to check out the new aircraft, from flight deck to rear galley. Everything about this new aircraft is impressive on a level not seen by most on board previously. Towards the rear of the aircraft, the flight attendants showed off the fire escape hatch from the upper crew rest. 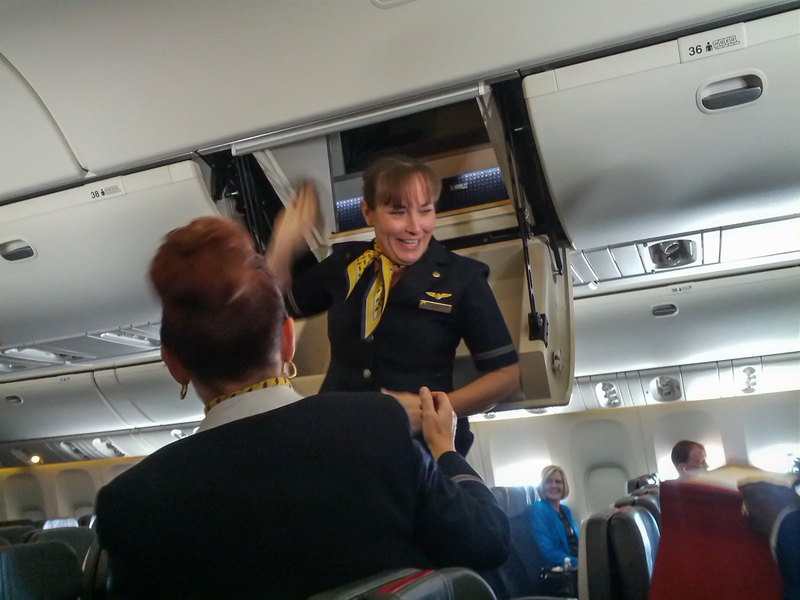 In the event of a fire or other emergency, an overhead bin doubles as an escape route back to the cabin level, and flight attendants had a blast trying it out for the first time. We even had a chance to try it out! The baggage is going to cost extra! Like the rest of the aircraft, the passenger experience is unlike anything else in the fleet. In flight, the entry area becomes a walk up bar, stocked with great drinks and snacks. Today, it was stocked with champagne, something not seen during normal flights due to issues of stocking a walk up bar with liquor. The area is lit with an LED ceiling with changing colors, no more yellow fluorescent lighting here. After we asked about the lighting, the crew gave the entire aircraft a bath in some LED color, showing off the capabilities of the system. From morning light, to breakfast service light, to “American party,” the lighting system is impressive to say the least, though we don’t imagine “American party” will be used too often in reality. After landing at Dallas, our “delivery” flight was nearing a conclusion. We taxied to an American maintenance hangar, and were greeted by a ceremonial spray down by the DFW fire department, welcoming us to Dallas. Once again, everyone on board gathered in front of the aircraft for a photo shoot, while holding up a banner in support of a sick employee, a very touching moment. Just like that, it was back to reality. 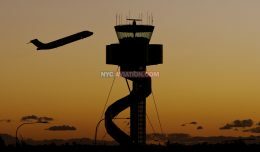 A quick bus ride back to the passenger terminal, and employees were back to dispatching flights, standing at the gate computer, and working the next flight to LAX, all with a new understanding on what their new aircraft means to the airline. A fresh start, a new look, and a chance to seriously compete with the best of the best, just like the good old days.